When his brothers had plotted against him some twenty years ago, Judah had spoke up and told his brothers, “What profit is it if we kill our brother and conceal his blood? Come, let us sell him to the Ishmaelites, and let not our hand be upon him, for he is our brother, our own flesh” (Genesis 37:26–27). Although he, along with Reuben, had kept his brothers from killing Joseph, he had not gone far enough to stop the actions of his brothers altogether. This time, however, Judah redeems himself and takes personal responsibility for the life of Benjamin. This act of self-sacrifice and responsibility was what Joseph was looking for in his brothers, and he could not hold himself together any longer. He breaks down in front of his brothers and sobs uncontrollably. We may often find ourselves the victims of unfortunate circumstances, whether it is through the hands of other people, tragedy, natural disaster, difficult situations, or even our poor choices. Nothing may be going our way and we may feel that all of the cards are stacked against us. We have an option, however, whether we remain the victim or not. We can overcome this victim mentality by understanding that although we may have our own plans for our lives, our lives are not our own and they ultimately belong in the hands of Heaven. Proverbs reminds us of this, saying, “The heart of man plans his way, but the LORD establishes his steps” (Proverbs 16:9). Joseph understood this principle well, and gave credit to God—even for the circumstances in his life that most people would consider horrifying. He realized that the Creator of the Universe was the one who was in control of his circumstances as well. He let his brothers know that despite their plans to get rid of him, Hashem had used it for His own purpose, saying, “It was not you who sent me here, but God” (Genesis 45:7). Later, he reminded his brothers, “As for you, you meant evil against me, but God meant it for good, to bring it about that many people should be kept alive, as they are today” (Genesis 50:20). This is not an easy task. We all struggle in some way and kick against the Divine Will. We have two choices. We can either blame others and be victims, or we can trust that our Creator has our best interest at heart. We may not be able to change our circumstances, but we can change our attitude. And changing our attitude can often change our circumstances, because it gives our Creator an opportunity to show himself faithful. 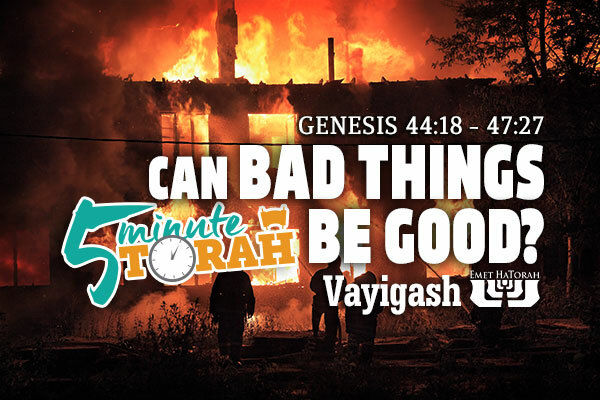 What does it take for God to turn bad circumstances into good ones? Maybe he just is waiting on us to let him.